-Added a number of new service markings decals, for the added nations. -Remade decals for the fictive countries of SF2 to match the default 256x256 resolution of other national decals. -The Mercenary decal no longer shows Dhimari colours; now it's generic and adapt for various scenarios involving mercenaries. -The Soviet Air Force becomes the Russian Air Force since 1992, with proper new decals showing up since 2010. -The Soviet Naval Aviation (Russian Naval Aviation since 1992) has been added as a separate service. 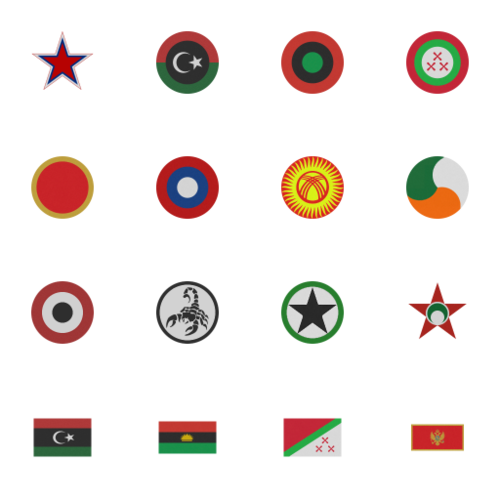 -The (Free) Libyan Air Force has been added and becomes active in 2012, in place of the Libyan Arab Republic Air Force. -Biafra and Katanga have been added and are active for a short number of years, as historically accurate. -The missing post-Yugoslavia nations, namely Montenegro and Republika Srpska, have been added. -The missing ex-Soviet Union nations of Belarus, Tajikistan and Kyrgyzstan have been added. -The Irish Air Corps has been added, with alternative decals in use since 1955. -The People's Liberation Army Naval Air Force has been added as a separate service, active since 1953. -The Somali Air Force is known as the Somali Aeronautical Corps before 1960, as historically correct. -The Burkina Faso Air Force is no longer active since 1964, now it's active since 1985; it shows up as the Upper Volta Air Force before 1985. -The Bahrain Amiri Air Force becomes the Royal Bahraini Air Force in 2002, as historically accurate. -Fixed a stock SF2 bug with the Sultan of Oman's Air Force not being selectable since 1959, as it should be. -Other very small changes here and there to other stock nations. -Added new medals for the following nations and respective services: Argentina, Australia, Belgium, Brazil, Canada, China, Cuba, Czechoslovakia, Denmark, Egypt, East Germany, West Germany, France, Finland, Greece, Hungary, India, Iran, Iraq, Italy, Japan, Netherlands, New Zealand, North Korea, South Korea, North Vietnam, South Vietnam, Norway, Pakistan, Poland, Russia, Soviet Union, Spain, Sweden, Syria, Taiwan, Turkey, Ukraine, United Kingdom, United States. Modders and users are advised to tweak their _userlist.ini files and _data.ini files for aircraft and ships, to make use of the new naval aviation services added by this mod. -Capitaine Vengeur, for his Modern Russian Federation Medals and Modern Ukrainian Medals packs. -Charles, for his Medals Pack v2.0 addon for SF1, which I have improved and updated to SF2 standards. -mue, for sharing info about the functionality of the alias.lst file. -eburger68, for some decals I borrowed from his huge campaign mods. I included the original readme files from the mentioned mods, where available, to the end of giving proper credit to everyone involved directly or not. This is a freeware; yet it can be redistributed ONLY in other CombatACE mods/mod packages. Any changes to the package's files and/or any copy-and-paste attempts of their contents are NOT authorized if you plan to release them in other mods. But permission might be granted to those who request it to me at CombatACE. This mod may NOT in any way, shape or form be used in any payware additions.